Turns synthetic oil into a motor oil lube treatment. Gives it a super lube and metal anti-wear. Restores a like-new power as it ends valve tap, oil burning, wear problems, and leaks. Mega Power goes where oil cannot. There, it can clean and frees sticking piston rings, valve lifters, and sticky valve stems, and fills worn spaces - The causes of oil burning, valve tap, and hidden power loss, and leaks. As you know, synthetic motor oil is not a problem preventer or problem ender. Although having plenty more additives - However, the purpose of extra additives in synthetic oil is to keep oil flowing both hot and cold while trying to maintain its oil lube film strength - the weakness in common engine motor oils have more a problem with. However, you may have noticed, synthetic motor oil in your older, and worn motors does not restore performance loss, and does not end oil burning nor engine valve tap, and rough idle. As the arrows an comments show in the picture shows, power-loss, oil burning, and valve tap conditions still exist - that synthetic oils cannot correct. What is needed to end those problems? Mega Power goes into those trouble-causing areas in your motor - and transmission, if also serviced with Mega Power, to clean, free, lube, fill worn spaces, and protect, as synthetic oil is not able to do. 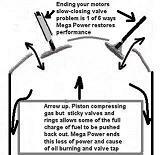 How to install Mega Power is simple - although the fix it does is complex. Direction: The product is marked for following the directions. There are 2 steps. Step one - add 3 items so marked to the fuel tank and motor oil. Drive as usual for a week. Step two is done a week later at an oil change using those marked items to the new oil. Driving then does the cleaning freeing conditioning neededd to restore your cars like-new former performanc. To perform "surface rebuilding" chemically as described a motor oil lube conditioner MC+ in Mega Power is part of the 6 anti-wear ingredients in the "treatment." In simple terms, this added advantage, MC+ layers over worn areas a slippery co-polymer, that also works to end friction wear, adding to Mega Power's ability to restores power, as it protects. Isn't all that what your motor, and all your cars need, to keep them going trouble-free? Sure! Ordering info is below. Order now, and get them conditioned so you can get on with life! This cleaning, freeing, protecting is a positive action allowing horsepower - horsepower that use to be absorbed and consumed overcoming dirty conditions and friction, can again pass thru to speed you down the road, now faster, on a bit less fuel. The product is sent to your door with easy to install instructions, phone help, guarantee, by FedEx in about 3 days. Order now! One Mega Power Motor Treatment Includes 6 items shown. Easy-to-follow directions. Phone help if wanted. Satisfaction Guarantee. Shipped to your door by FedEx in 3 days. Just $65, plus $15 s&h= $80 total. To ask a question or order by phone, call me at 512 665 338 - day or evening ok. At 512 665 3388 ...george Goes where oil cannot. Turns synthetic oil into a motor oil super lube and metal conditioner anti-wear. The good thing about synthetic oil is is its ability to run twice as far before overload and breakdown occurs. Restores like-new power as it ends valve tap, oil burning, and leaks. Oil conditioner lube anti-wear cuts friction wear, restores power, protects - often doubling the remaining life in their treated cars, compared to other car owners who must overhaul or buy a new car for better transportation.